A New Abuse-Deterrent Opioid - Xtampza ER | The Medical Letter, Inc.
ABUSE-DETERRENT OPIOIDS — Five other abuse-deterrent opioid formulations were approved earlier, three as single-drug products and two in combinations with opioid antagonists.1 Two of these products, Morphabond (morphine ER) and Targiniq ER (oxycodone ER/naloxone), have not yet been marketed. Zohydro ER (hydrocodone ER) was reformulated in 2015 to make abuse more difficult, but it has not received FDA approval as an abuse-deterrent opioid. No studies are available comparing the relative safety of these products. No opioid formulation prevents consumption of a large number of intact dosage units, the most common method of abuse. Abuse-deterrent formulations have one or more properties that make their intentional nontherapeutic use more difficult, less attractive, or less rewarding. THE NEW FORMULATION — Xtampza ER is available in capsules containing microspheres formulated with oxycodone base and inactive ingredients that make the formulation more difficult to manipulate for the purpose of abuse. Each capsule contains 9, 13.5, 18, 27, or 36 mg of oxycodone (equivalent to 10, 15, 20, 30 or 40 mg of oxycodone HCl, respectively). ADVERSE EFFECTS — Nausea, headache, constipation, somnolence, pruritus, vomiting, and dizziness, all typical opioid side effects, occurred commonly in the clinical trial in patients treated with Xtampza ER. PREGNANCY — As with other opioid analgesics, prolonged use of Xtampza ER during pregnancy can cause neonatal opioid withdrawal syndrome. Oxycodone is excreted in breast milk and can cause opioid effects in breastfed newborns. DOSAGE AND ADMINISTRATION — The recommended starting dosage of Xtampza ER for opioid-naive patients is 9 mg every 12 hours. The capsules must be taken with food; patients should consume the same amount of food with every dose in order to ensure consistent plasma levels. For patients who have difficulty swallowing the capsules, their contents can be sprinkled on soft foods or into a cup, and then given orally or through a gastrostomy or nasogastric tube. The maximum daily dose of Xtampza ER is 288 mg (equivalent to 320 mg oxycodone HCl). The package insert contains dosing instructions for conversion from other oxycodone formulations or other opioids. Patients with hepatic impairment starting Xtampza ER should take one-third to onehalf the usual dosage; they should not take the drug if the required dose is <9 mg. Patients should be monitored for respiratory depression for 72 hours after either starting treatment or increasing the dose. 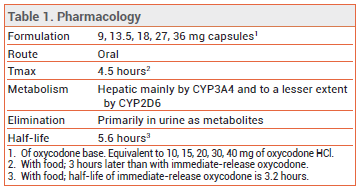 CONCLUSION — Xtampza ER is the second extended-release abuse-deterrent formulation of oxycodone. 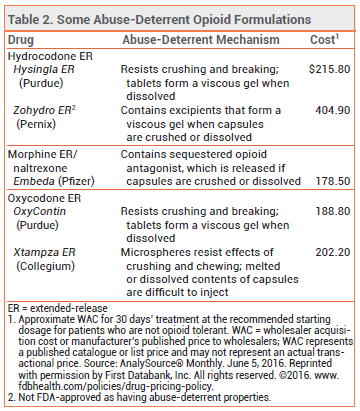 How it compares to the abuse-deterrent formulation of OxyContin for prevention of misuse is unknown. Whether use of abuse-deterrent opioid products actually reduces overall opioid abuse remains to be determined. J Gudin et al. Comparing the effect of tampering on the oral pharmacokinetic profiles of two extended-release oxycodone formulations with abuse-deterrent properties. Pain Med 2015; 16:2142. LR Webster et al. A randomized, double-blind, double-dummy study to evaluate the intranasal human abuse potential and pharmacokinetics of a novel extended-release abuse-deterrent formulation of oxycodone. Pain Med 2016; 17:1112. N Katz et al. A phase 3, multicenter, randomized, double-blind, placebo-controlled, safety, tolerability, and efficacy study of Xtampza ER in patients with moderate-to-severe chronic low back pain. Pain 2015; 156:2458.